← Three Years and Counting: My Gastric Sleeve Anniversary Month! With my hat and shorts, I was ready to start Summer Vacation 2016! Being comfortable in my own skin is one of the best rewards of my weight loss journey! Another summer is winding down and it will soon be time to get back to the “real world.” You know, the world that includes a schedule, rules, and hard work for children and their parents. There is something to be said for a bit more structure in life, but I must admit I’ve really enjoyed the relaxed months of summer. 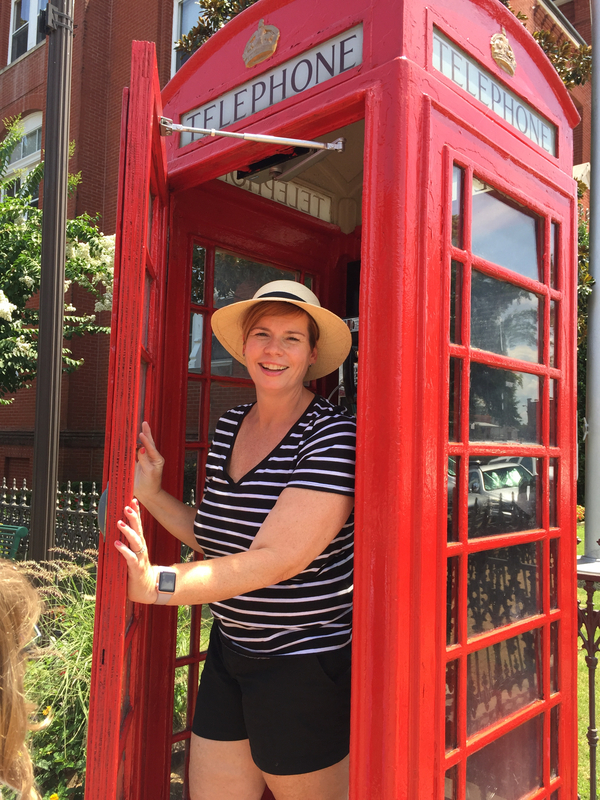 Besides my children fighting with each other, this summer was full of days of “let’s see where the day takes us.” Our 12 day vacation to the East Coast was full of those kind of days. I also realized that for me it was full of really active days, which before my gastric sleeve surgery, wouldn’t have happened. *Food was enjoyable, but not the end all, be all of the vacation. Now, I’m not saying I didn’t look forward to every meal in New Orleans. It is an amazing place for food! I’ve learned to savor special foods and meals, but that doesn’t mean overindulging. One beignet gives me the same satisfaction as three beignets would in the past. Certain foods and drinks like pralines and Pimm’s Cups I only eat or drink when I’m in New Orleans so I know that it’s a treat. My weight loss journey has taught me to enjoy the treats because they’re special and not everyday food. Here I am overlooking Jackson Square on my 7AM run in New Orleans. It was well worth the 80 degree heat and humidity to run through this beautiful city. And the beignet at the end didn’t hurt, either. *I realized “formal” exercise on vacation can be fun. OK, full disclosure here…I only ran once on my trip. The only vacation I’ve run on was in May for the Tinker Bell Half-Marathon, so this was a big step! 7AM on a hot and humid morning, I was out there running through the French Quarter. It will go down as one of my favorite runs. Not that I ran fast or for very long, but on this run I really felt like a runner. What I mean is that I didn’t run for any particular goal, I ran because it felt good. I didn’t run with any music as I normally do; I took in the sights, sounds and some unfortunate smells from Bourbon Street. This run was also for research for the novel I’m working on, but I would do this run over and over just for the joy it gave me. And yes, I did end the run at Cafe Du Monde. I earned that beignet that morning! *Nothing reminded me more of the success of my weight loss than being active. Now, I’m not talking about formal exercise, but just the fun activities you do on vacation. Walking around New Orleans in 90+ degree weather isn’t as draining as it was when I was obese. 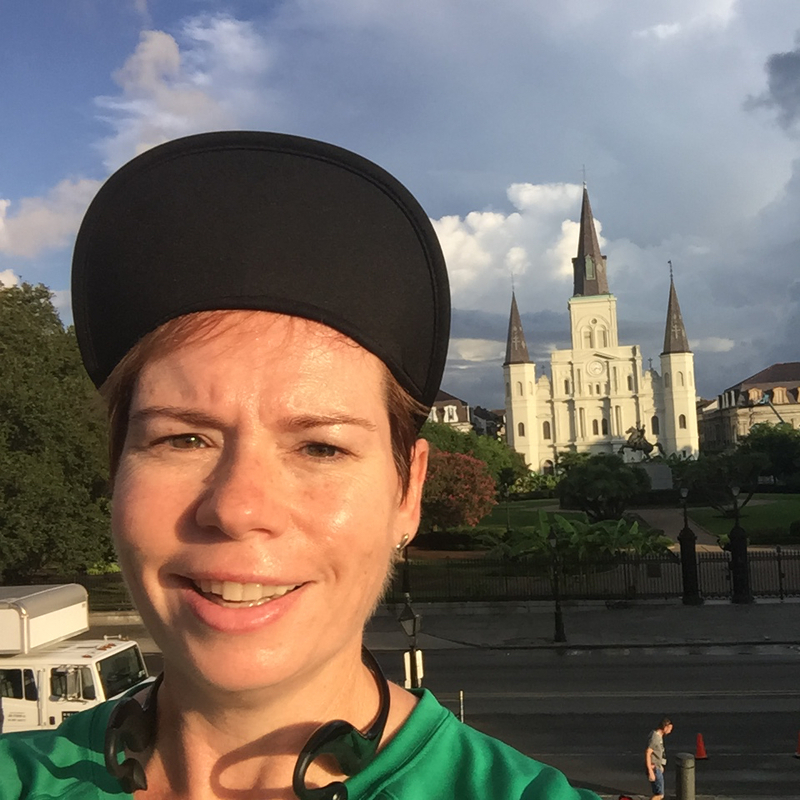 On one day, between running and touring the French Quarter, I went 8.5 miles that day. I would have been miserable if I had even tried that before my surgery; actually I wouldn’t have tried to cover that much ground. I try not to think about the activities and places I missed in the past when I wasn’t interested in being active. I am thankful I have the body and mindset to appreciate the places I get to go now as a healthy person. *Letting go of my body issues means more fun, especially on vacation. I shared a few years back about how I’ve learned to wear bathing suits and sleeveless shirts without care, and this vacation I took this to heart. Yes, my thighs are wrinkly and flabby, but who cares? My arms aren’t full of muscles, but sleeveless shirts are comfy and look good! Now that I have a properly fitted swimsuit, I am out in the pool and beach with everyone else. Really, when you feel confident you look good, not matter what size you are. So there I was at the pool and the beach enjoying my time with my family, not thinking about how I looked. When the waves at the Atlantic Ocean knocked me over, I just pulled up my suit, brushed my hair off my face and went back to laughing with the people I love spending time with the most. Thank goodness I learned to appreciate my body for what it can do! 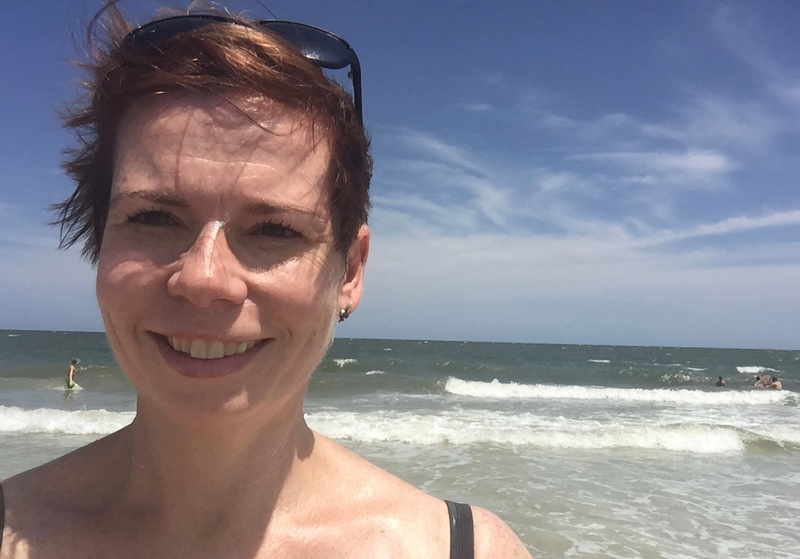 A visit to Florida isn’t complete without a trip to the beach! Neither getting into a bathing suit or the big waves kept me from having fun in the surf with my family! There was one day in particular that summed up my new life as a healthy person. My fun-loving sister brought 300 water balloons for us to play with at my parents’ home. Yes, three adults and four children were going to have an epic water balloon battle. I shared with my sister that I wouldn’t have wanted to take part in something like this before my weight loss. When you’re obese, the thought of being in a bathing suit and running around is terrifying. I know three years ago, I would have watched from the sidelines, smiling at everyone else, but feeling sad that I wasn’t part of it. As I ran around the yard, dodging water balloons and chasing everyone, I couldn’t help but grin from ear to ear. Well, first, I’ll admit it was really, really fun to throw water balloons at my children. While it will never make up for the years of watching Power Ranger at 5AM during their toddler years, it was satisfying to run after them during the battle. And I know they loved chasing their mom around knowing there would be no repercussions for dousing their mother with water! If you want to feel like a kid again, start a water balloon fight! Getting to chase your kids with water balloons is the best therapy ever! Running around after losing weight is so much fun!. The battle was short, but oh, so, very sweet. I can’t think of a better example of how far I’ve come in my weight loss journey. I didn’t think about how I would look in photos, wearing a bathing suit and running around like a crazy person. I got out there and took part of a fun and special moment on our vacation. I didn’t let the fun happen around me…I was part of the fun! Being present and contributing to a happy moment in my family’s life was life affirming, as dramatic as that may sound. This entry was posted in Bariatric Surgery, Gastric Sleeve Surgery, Life After Gastric Sleeve Surgery, Lifestyle Changes, Maintaining Weight Loss, Running, Weight Loss and tagged bariatric surgery, Before and After Weight Loss, Exercise, Family, Food Lifestyle, gastric sleeve surgery, Healthy, Lifestyle Changes, Maintaining Weight Loss, Running, Vacation, Weight Loss, Weight Loss Journey. Bookmark the permalink. Thank you for making it happen! So thankful to have you in my life!